Astrophotography is exactly how the name sounds—taking pictures of the great unknown. However, astrophotography requires a different type of telescope altogether. The NexStar 130 SLT is built by the same company, Celestron, that makes the AstroMaster 114 EQ, also a great telescope. There are fundamental differences that come with the 130 SLT, specifically the optics that are involved for the telescope to specialize in astrophotography. It is not uncommon to see people modify their typical telescopes to be astrophotography capable. However, this process can be very risky if you don’t know what you’re doing. That is why the 130 SLT, being dedicated to astrophotography, will be the best choice for you to avoid all the risks of modding. To start, the 130 SLT is computerized, unlike most telescopes that you can simply look through with no questions asked. SInce the 130 SLT is a dedicated astrophotographer, the computer systems, and the photography software can be a little tricky to operate. Most customers have found issue with errors that usually stem from a mix-up in the process of setting the telescope up to take pictures. You can count on the 130 SLT being more delicate and sensitive to sudden movements than most telescopes. You might have the perfect picture of a celestial object lined up, and then lose the entire focus because of vibration or disturbance. Be careful around it and its computer hardware! Smaller the Aperture (big numbers)— The less light enters the lens, but you will get more precise and sharper photos. Bigger the aperture (small numbers)— The more light enters the lens, allowing for better depth of field and more light gathering from distant objects. It can be quite confusing to remember the inverse details of aperture, but it’s important just to practice and test the limits of the 130 SLT. The telescope also sports a feature called SkyAlign, enabling you to align and focus on up to three bright objects in the sky. There are innumerable numbers of stars and objects giving off an extraordinary amount of light, so don’t feel limited! The 130 SLT comes equipped with a motorized Altazimuth mount. This makes it easier to track objects as they move across the sky instead of using your hands. The real difference maker is the brightness of the object you are looking at. If you are trying to look at a far away planet or object, there’s a good chance it might not generate enough light for the telescope to see. 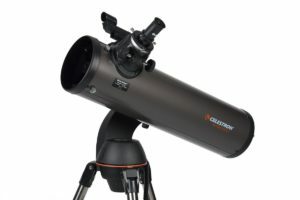 Similar to the accessories of the AstroMaster, Celestron provides you with a 4,000 object database to scour the sky for. Having the database is one thing, but the night sky is never the same as the evening before, so be on the lookout for new objects that appear each night! The 130 SLT will be one of the more tricky telescopes to handle given its purpose, but that doesn’t mean it’s unfriendly to beginners. It will cost you a couple of hundred bucks, but you have to put that into perspective. You’ll be receiving one of the best astrophotography telescopes out there with some different features included. With all the various tools and programs included, rest assured that you’ll be taking and saving pictures of the stars and planets in no time.